Find out for yourself about Spanish and Portugueuse flair on a Guadiana River Cruise. Experience the Andalusian landscape with all its uniqueness and tradition. Take a trip under the south European sun to historically significant places and uncover this region&apos;s special qualities. The Guadiana is a 742 km-long river on the Iberian peninsula, which flows through Spain and Portugal. Rising in south-eastern Spain, it flows westwards before finally discharging into the Atlantic on the southern coast of Portugal. The best time for a Guadiana River Cruise is the spring and autumn months. Of the total length of 742 km, only the 72 km downstream of Mértola are navigable. Mértola is a very old Portuguese town, which was the site of a harbour as long as 3000 years ago. This long history has been gradually brought to light over the years by excavations. The Roman and Moorish finds which have been unearthed throughout the town are exhibuted in two highly recommended small museums. The town itself, with its red tile roofs and white walls, is typical of the region. 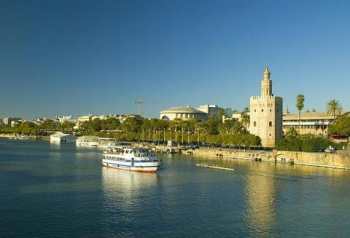 Another destination on the river is Sanlúcar de Guadiana. The pretty little harbour and the castle of San Marco are two captivating sights. Nature lovers are also encouraged to explore the surrounding areas. The mouth of the river is the location of the Spanish town of Ayamonte. Tourist attractions here include the "Iglesia de las Angustias", the town&apos;s most significant church, which dates from the middle of the 16th century, alongside a whole array of other interesting buildings from recent centuries. Come on a journey through sunny southern Europe and discover the relaxed atmosphere of a Guadiana River Cruise.